Many of our services are open to residents of any community age 60 and over. If you have questions about your eligibility, please call us. Through a partnership with Senior Transportation Connection (STC) services are available to eligible riders. Destinations include local shopping, individual health care and other appointments, and to and from agency programming. Registration is required prior to using this service. An evening and weekend transportation service for seniors and disabled riders goes countywide, with the help of a federal grant. STC PLUS originally launched in North Olmsted, as a new option for evening and weekend travel for seniors and adults with disabilities. STC PLUS allows passengers from anywhere in Cuyahoga County to book their own travel in a fully accessible vehicle, for social, recreation and worship purposes. Ask about this option when calling to register. Each weekday, a congregate meal is offered in one or more of the communities served by the agency. Those 60 and over of any community may make reservations for the meal (reservations are taken by phone no later than Wednesday at 5:00 for the following week’s meals) by calling (216) 650-4029. 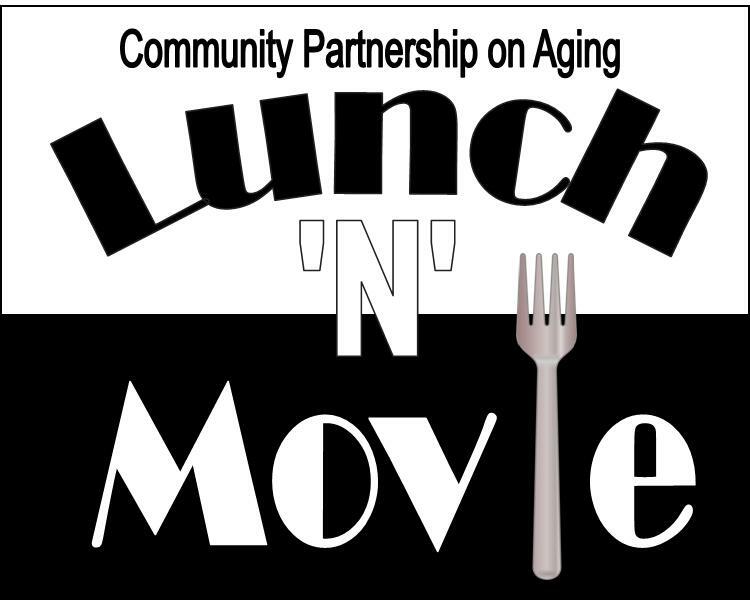 Community Partnership on Aging also offers three scratch-prepared meal options: Cafe Lunch, Lunch ‘N’ Movie in Mayfield Village and Lite Bite Lunches. Please refer to the CPA newsletter accessible from our Home Page or click on the Cafe Services tab on the right side of our Home Page. Licensed Social Workers provide in-home visits to people 60 and older who may benefit from assistance, or who have questions or concerns about matters affecting their physical, social, financial, or emotional well-being or independence. After determining if ongoing help is needed, you, and your family, if you wish, can be referred for ongoing services. Other services offered through Outreach include the administration of Ohio Benefits Bank (to determine eligibility for discounts and entitlement programs); Healthy IDEAS (for management of depression) program; information and referral; education; consultation; supportive counseling; and support with life transitions and decision making. Homemaker staff employed by the agency provide assistance to those unable to perform routine housekeeping tasks. Priority is given to those who do not have others who can assist them, who have health issues, or who are unable to pay for private services. Service is approximately two hours every two weeks. Service can include linen changing, dusting, vacuuming and other light housekeeping tasks. Active adults 55 and over from any community are welcome to participate in one or multi-day trips to a variety of destinations. Trips are planned to provide comfortable travel to exciting and educational destinations, along with companionship and lasting memories. A variety of exercise classes, wellness opportunities; AARP Drivers Safety and Matter of Balance classes; educational programs; entertainment, cultural programs; and social groups are offered daily according to the calendar of events contained within the agency’s monthly newsletter. All programs, classes and events are open to the public, although registration may be required. Offering opportunities to engage in meaningful activity by volunteering or receiving volunteer services are a focus of this program. Our volunteer coordinator will work with those in need of services to determine their needs. She will also work with potential volunteers to learn about their skills, life experiences and interests so that a successful match can occur. Volunteers assist with a wide range of projects including serving on committees, clerical work; escorting trips; assisting with agency programs; minor home repairs; offering friendly visits; cleaning yards; assisting with trash or recycling removal; and much more. See the Volunteer Opportunities page if you wish to offer volunteer services. When an older resident of our communities needs help around the hose, they can make use of the list of skilled chore people available in our office. The list is compiled from references and referrals from other seniors so that you can feel more comfortable using services. Names of service-people are provided to callers when a request for chore information is received. If you are someone who needs grab bars, hand rails or other minor modifications to your home in order to remain independent, consider applying for our Safe at Home program. Applications are available here or from one of our office locations. The program offers older adult homeowners in member cities access to both durable medical equipment and dollars that will enable those of lower income or face other barriers to apply for and receive tools and equipment that will assist in adapting their homes for comfort and safety. The tools and equipment may include (but are not limited to): grab bars for showers, baths and other transitional areas; transition strips; motion detector lights; carpet stretching; light bulbs; flashlights; batteries; radios; shower chairs; hand-held shower faucets and more; hand rails; and other items determined to be needed. The Safe At Home Program is administered by a Community Partnership on Aging Social Worker and will include a home assessment as well as an application with income and asset verification. Additionally, Safe At Home utilizes local businesses and contractors for purchase and installation of the equipment, which will, in turn, assist in boosting the local economy. Click this link to access the Safe at Home application. 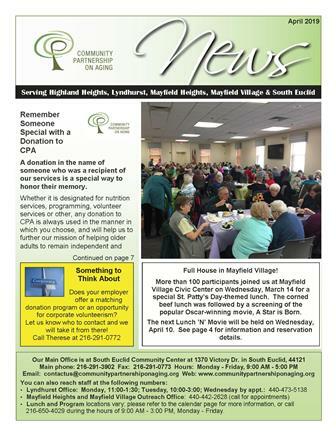 Our Community Partnership on Aging News is published monthly and contains current information on events, programs and the daily menu. 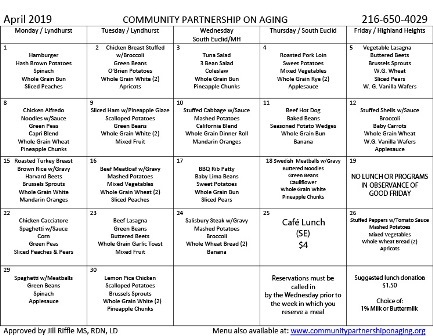 It is available at our offices, lunch sites, community centers, city halls and at various locations throughout the community, as well as on the agency website at www.communitypartnershiponaging.com. For a small subscription fee, the newsletter can be mailed to your home. If you would like the CPA newsletter mailed, send a check for $9.00 to Community Partnership on Aging at our main office at 1370 Victory Dr., South Euclid, Ohio 44121. Make sure you reference the newsletter subscription on your check. To find out if you or a loved one is eligible, call 216-291-3902. Click the image of our newsletter to view it on your computer browser; or, scroll to the bottom of our home page to find out how you can get a paper copy! 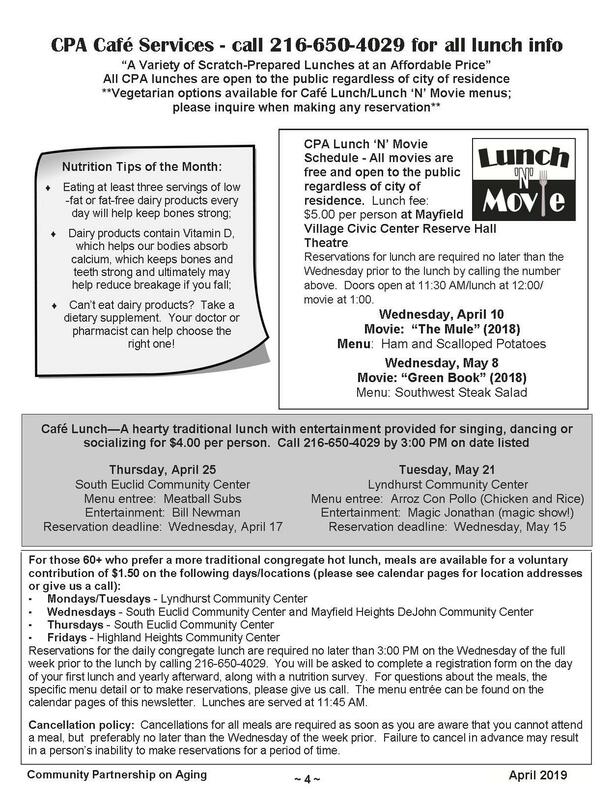 April 2019 CPA Cafe Services Menu – Click the Pic Below! Reservations must be made no later than the Wednesday prior to lunch. Call 216-650-4029. Event and Trip tickets are transferable. In the event that Community Partnership on Aging deems it necessary to cancel an event or a trip refunds will be provided.